OTTAWA — The RCMP and the Conservative government are targeting three of the most volatile native reserves in the country as part of a new effort to battle contraband tobacco and organized crime. A report released yesterday by Public Safety Minister Stockwell Day and RCMP Assistant Commissioner Raf Souccar singled out Kahnawake in Quebec and Tyendinaga and Six Nations in Ontario as the Canadian sources of illicitly manufactured tobacco. Factories on the U.S. side of Akwesasne, which straddles the Canada-U.S. border, remain the largest producers of illegal tobacco in Canada, and Mr. Day said he was working with American officials on that front. This is what happens when a Police force is not being ordered to stand down by their chief. 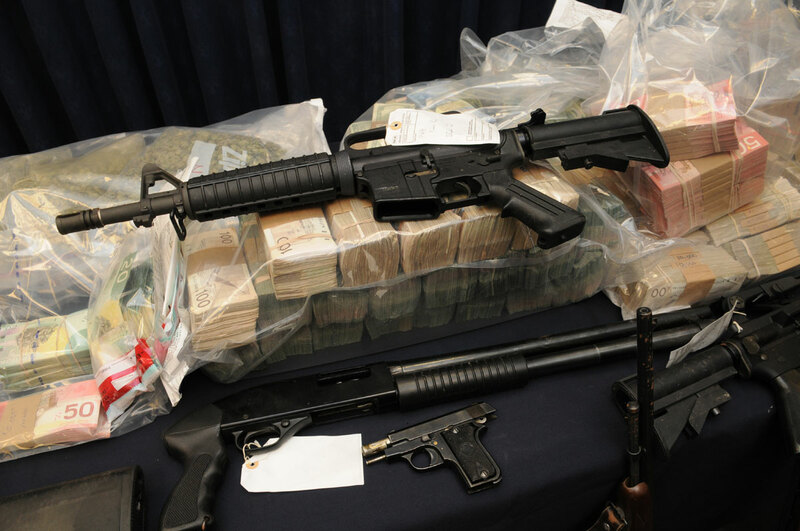 MONTRÉAL, Wednesday, March 26, 2008 – Early this morning, the investigators of the Aboriginal Combined Forces Special Enforcement Unit (A-CFSEU) dismantled a criminal organization that allegedly specialized in the trafficking and exportation of marihuana to the United States. Most people would think they know what is in the cigarettes they are smoking. If the cigarettes were smuggled and you bought them off the street, think again. Contraband cigarettes and tobacco that were seized in B.C. were found to have insect eggs, dead flies, mold, and even human feces! RCMP labs have been testing counterfeit and smuggled cigarettes that were seized in 2006, also found some cigarettes that were entirely stuffed with tobacco stems. An interesting story that although not directly related to Caledonia demonstrates how the Police can ignore your most basic rights at will in Canada and get away with it. The Supreme Court of Canada has upheld the murder conviction of a B.C. man in a case viewed as a test of how police interrogation tactics should square with the charter’s long-protected right to silence. The court ruled 5-4 Thursday against the appeal from Jagrup Singh, a 31-year-old from Surrey, B.C., of his 2002 conviction for second-degree murder. The case revolved around the question of whether police breached Singh’s right to remain silent when they persisted in questioning him about a shooting, even though he repeatedly made it clear that he didn’t want to talk. Under the Charter of Rights and Freedoms, the accused has the right “not to be compelled to be a witness” against himself in criminal proceedings. “It is not appropriate to impose a rigid requirement that police refrain from questioning a detainee who states that he or she does not wish to speak to police,” Justice Louise Charron wrote in her majority opinion. CaledoniaWakeUpCall and VoiceofCanada have obtained a copy of the Statement of Claim for a $12,000,000 lawsuit against Gwen Boniface, Julian Fantino, Brian Haggith and the Province of Ontario by Caledonia residents Dave Brown and Dana Chatwell. 31. The Haldimand Police Services Agreement requires the O.P.P. to be capable of providing provincial-level of response that can be mobilized for emergencies, disasters and specialized needs. Section 55 of the Police Services Act authorizes the Solicitor General, not the Minister of Public Infrastructure and Renewal, to make an agreement with the Crown in Right of Canada or of another Province or with any Federal or Provincial agencies including the Canadian Armed Forces for the provision of police services in an emergency. It appears the OPP may have finally taken some action against native protestors in Caledonia. Reports from the scene of a long standoff at a housing subdivision indicate cops moved into the disputed land on Wednesday afternoon and took 18 people into custody. All those arrested are said to be natives. There’s no word on what prompted the police action or if any charges have been laid. But there doesn’t appear to have been the kind of violence many fear a police move might incite. And the OPP hopes to keep it that way. “We’re just asking everybody to be respectful to each other while this is unfolding and we’ll have a peaceful resolution at the end of the stay,” offers Sgt. Dave Rektor. This latest incident follows a violent confrontation that took place last week between a home builder and those on the land. Fifty-two-year-old Sam Gualtieri was discovered unconscious and bloody after he went to check out a home under construction. The RCMP has issued a formal apology to a B.C. First Nations community for an incident this week that saw an officer pepper-spray several residents, including children and infants. Officers and residents struggled after the driver of a pickup truck with several children in the back refused to stop for police. In a letter to the community, the Sunshine detachment said police had no intention of directly spraying children while trying to control adults as they were making an arrest. police have said the officers were forced to use pepper spray when angry people got too close, adding that a home video shot by the band’s own members proves that. Several aboriginal parents in a town northwest of Vancouver plan to file a complaint with the RCMP after a community celebration ended in pepper spray use and a confrontation with officers. It all happened Monday night in Sechelt, B.C., after the Sechelt band’s two youth teams won first prize at a soccer tournament in Vancouver. The parents said it is a community tradition to celebrate with a grand entrance by honking horns. RCMP Const. Annie Linteau said Tuesday police saw 10 youths standing in the back of a pickup truck, and tried to stop the vehicle. She said when the driver finally stopped, he approached the officers in a hostile manner. In addition, a crowd of 50 to 75 people quickly became confrontational. Shannon Phillips said she was carrying her baby and tried to intervene on behalf of her husband, Troy Myers, who was the driver of the pickup truck. Calvin Craigan, a former chief with the Sechelt band, told CBC Radio Tuesday that band members are “going to have a session with the RCMP” and demand an explanation. EDIT: NOW.. Before we start reacting to the fact that some people got pepper sprayed here, be sure to read the full story and the many many comments on this incident from Canadian citizens and an RCMP officer. Imagine if the head of the Ontario Provincial Police announced on the eve of a probe touching on a major Canadian figure that the figure is an honourable man who has been given a bum rap. It just happened. OPP Commissioner Julian Fantino went publicly to bat this week for former RCMP commissioner Giuliano Zaccardelli, a key figure in lawyer David Brown’s report on a pension-fund scandal inside the national police force. Yet the OPP is soon to begin a review of how that scandal was investigated by the Ottawa Police Service. Kindness or exoneration, the outburst is premature. The effect is to make the OPP look as if it has reached conclusions before it begins its review, though whether those who actually conduct the review will be influenced is impossible to know. Auditor-General Sheila Fraser has already said the Ottawa police investigation lacked the appearance of independence, because the lead investigator reported directly to an assistant RCMP commissioner. The highest standards of independence and propriety are needed for the investigation of a major Canadian institution and its leadership. Mr. Fantino’s comments suggest an old boys’ network is in charge. OTTAWA — Ontario Provincial Police Commissioner Julian Fantino said yesterday he has always known former RCMP commissioner Giuliano Zaccardelli to be an honourable man, and was surprised he has been “so vilified” in public comments about the Mounties’ pension fund scandal. Several members of the RCMP have said Mr. Zaccardelli tried to thwart the initial police investigation four years ago. Commissioner Fantino has been a professional friend of Mr. Zaccardelli for many years, since Commissioner Fantino was the chief of the Toronto Police Service. Assembly of First Nations and the RCMP have signed a protocol aimed at ensuring protests don’t turn ugly. OTTAWA — With the threat of native rail and road blockades looming, the Assembly of First Nations and the RCMP have signed a protocol aimed at ensuring protests don’t turn ugly.Surrounded by the scent of burning sweetgrass, AFN national chief Phil Fontaine and interim RCMP commissioner Beverly Busson hailed the pact as key to maintaining good relations between natives and the Mounties. “The purpose of this protocol is to establish trusting and reciprocal relationships among the parties with the goal of addressing issues of mutual concern and preventing crisis situations from arising in First Nations communities and resolving any crises that may arise at the earliest possible opportunity,” says the text of the agreement. Both Fontaine and Busson said they are hopeful that the national day of action on June 29 will be a peaceful way for Canadians to gain a better understanding of native issues.